Anchor Bay has recently finished development on a major update to their popular DVDO iScan Duo external video processor. This update provides it with exceptionally powerful video calibration capabilities. At an MSRP of $1299 and street prices below $1000, this is a surprisingly affordable option for those looking for world-class video processing, transcoding, and switching (it offers eight 1.3 HDMI inputs and 2 HDMI outputs, plus a host of analog inputs) and custom calibration controls. 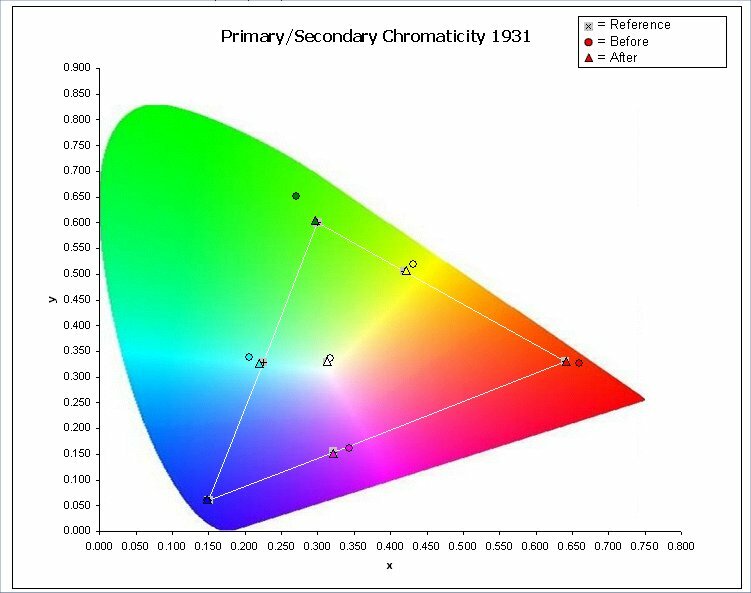 Those calibration controls include an 11-point gamma/grayscale adjustment and a full-featured color management system (CMS) that allows the user to independently adjust the saturation, hue, and brightness of the primary colors and secondary colors. The development of the Duo's calibration features has been incremental, appearing feature by feature in a series of firmware updates over the last few months. The original update was promising, offering the aforementioned gamma/grayscale adjustment tool and a more limited version of the CMS. With this latest update, the calibration capabilities of this truly revolutionary product have been enhanced substantially. Consider the following. An early version of 11-point gamma/grayscale adjustment tool operated in a gamma-weighted color space. The result of this was that user adjustments had noticeably non-linear effects. You could adjust the RGB controls at a particular level of stimulus several ticks and nothing seemed to change, until all of a sudden a very large measured change in the white balance would appear. This made getting accurate white balance adjustments very tricky. Anchor Bay has since re-engineered this tool so that it operates in linear color space. This means that a gamma-weighted source signal comes into the unit, the processor then applies a de gamma function to this, which puts the signal into a linear color space. The gamma/grayscale tool works on this. Finally, gamma is reapplied for output to the display. This may sound like an obscure and unimportant technical distinction, but for the user it means that gamma/grayscale adjustments are now much smoother and more predictable. In the early firmware releases, the gamma/grayscale tool offered only RGB adjustments. While this was perfectly adequate for making grayscale changes, it made gamma adjustments extremely tedious. The reason for this is that gamma is a function of the total light output of the device at various levels of stimulus. What this meant for the user was that he or she had to individually adjust the R, G, and then B controls equally to achieve the desired change in gamma response. With the latest version, Anchor Bay has added to the standard RGB adjustments a set of xyY adjustments as well. This allows the user to change the chromaticity of the white point at the selected level of stimulus by adjusting its xy coordinates, but the more important change is that the Y parameter gives the user a single control over the gamma response. There is no longer any need to balance the adjustments of three separate controls. This, along with putting all of these controls into a linear color space, is a major usability enhancement. Finally, and most importantly, the Duo's original CMS implementation was 2D (saturation and hue only) and operated on the primary colors only. A fully realized CMS is 3D (saturation, hue, and brightness) and provides individual adjustments over the primary colors (red, green, and blue) AND the secondary colors (yellow, cyan, and magenta) as well. The Duo now provides a complete 3D CMS with individual adjustments for the hue, saturation, and brightness of the primary and secondary colors. I can report from extensive use that the Duo's CMS functions exactly as promised. This is a particularly useful feature for displays with inaccurate color, which is to say most displays. The only other product product with comparable capabilities is the Lumagen Radiance XS ($3499). Until now, it was the only full-featured video processor that offered a full range of calibration controls. The only real problem with the Radiance has been cost. At over 3-thousand dollars, this unit is more expensive than most commercial displays, and as such it remains a boutique item reserved for a relatively small market of video enthusiasts who can afford to spend this much on a video processor. However, with the Duo's street prices below $1000, external processing and calibration control are now within the reach of a much larger audience. As a processor/transcoder/switcher the Duo gives up nothing to the best that's available. The proprietary ABT2010 processing chip used in the Duo is arguably as good as anything in the business. The Duo's user interface is quite user-friendly as well. The basic image quality from both the Duo and the Radiance is difficult to fault. I may slightly prefer the Duo's rendering of SD material, but the subjective difference between them is extremely small, both pass all of the standard deinterlacing tests contained on the HQV Benchmark disc with flying colors, and each no doubt offers a mix of strengths and weaknesses that will appeal to its own set of users. For example, the Radiance offers some nice usability features that the Duo lacks, such as the ability to save a configuration as a file and then subsequently apply it. This is an immense time-saver if you ever need to reapply your calibration settings. The Duo, on the other hand, has a simple and colorful user interface that is a joy to use. The one area where the Radiance clearly had a leg up on the Duo is was in their respective CMS implementations. However, the Duo has not been a standing target. With its latest iteration, the CMS functionally of the Duo now seems essentially the same as the Radiance's, though the human interface on each is different. The controls on the Radiance are strictly RGB. The user changes the RGB values for each color as a way of changing that's color's hue, saturation, and brightness. The Duo, on the other hand, uses a different approach. The user adjusts the CIE xyY values up or down to change the selected color's saturation, hue, or brightness. So if green, for example, measures x0.578, y0.679, Y0.691, you use the included remote control and onscreen display to adjust x up and y and Y down to match the HD standard of x0.300, y0.600, Y0.715. The changes you make are reflected in real time on the screen. All the user needs is either a continuous read-out of the raw xyY values (and knowledge of what the proper targets are) or a chart that continuously plots the color targets and measured values. ChromaPure provides both. The Duo's reliance on manipulating xyY values is unusual, but I found it very straightforward to use. I suppose I would have preferred a more user-friendly set of saturation, hue, and brightness controls, but this is picking nits. Since the Duo performs about as well as anything as a digital video processor (there is no analog output), and since its calibration controls are comprehensive and well-implemented, it is hard to avoid the conclusion that the Duo is a breakthrough product. There is nothing on the market that offers this mix of power, flexibility, and control at anywhere near its price. I tested the Duo's calibration controls on a Pioneer PDP-5080 Kuro plasma. First, I set the user controls at their optimum settings and used ControlCal to improve the grayscale tracking. Even after this, this standard Kuro displayed oversaturated reds and greens, a slightly yellowish grayscale, and a reasonably flat, but too-low gamma. Next, I used the Duo's 11-point RGB grayscale controls to correct the slightly yellowish white point. Here are the results. As you can see, the grayscale was blue-deficient before calibration with the Duo and nearly perfect after. The grayscale was not bad before I started. What this shows is that the Duo's controls are sufficiently sensitive to successfully make even fine adjustments. In the end, I cut the average white balance dE error from a small 3.8 to an invisible 1.1. Next, I turned to calibration of the Pioneer's gamut. Here are the effects measured in dE. Next, the same data broken out into errors in hue, saturation, and lightness. Finally, a standard CIE chart. This data shows that the Duo's color management system allowed me to reduce the all measurable color errors to below the threshold of visibility. Even before DVDO added control over the secondaries the CMS was quite effective. This is because the secondary colors are derived from the contributing primaries. Get the primaries right and the secondaries should fall into line. Previous industry attempts to provide a CMS without secondary controls in an affordable product failed in that regard. Adjusting the primaries actually had a negative effect on the secondaries, substantially desaturating them beyond their intended targets. The Duo suffers from no problems of this type. Finally, let's look at the effect on the gamma response. The controls all worked exactly as designed, and I experienced no problems in the hour or so it took me to finish. The bottom line? If you are looking for a video processor or standalone calibration tool with 11-point gamma/grayscale adjustments and a full-featured 3D CMS, you simply cannot do better than the DVDO iScan Duo. Some competitively priced products offer the calibration tools, but they require an external PC and offer none of the other advantages of a high-end video processor. Other products still offer a similar feature set to the Duo, but at a much higher price. This is an addition to a high-end home theater that can actually visibly improve the image quality and not by a subtle amount. It is hard to deny that the DVDO iScan Duo is a breakthrough product. It is the first fully-featured external video processor to offer such a powerful mix of image processing and calibration controls at an affordable price.